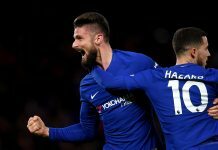 Chelsea ensured they would be top of the tree at Christmas with a 2-0 victory in what looked to be a potential banana skin for the league leaders. Having beaten Manchester City and Arsenal already this season, Mourinho would have expected to be given a tough game against the Staffordshire side, but an assured performance in which Chelsea both stood up to and played around the physical presence of Stoke ensured the Blues would take three points back to London. Mourinho’s away side lined up with their default defence – Courtois, Ivanovic, Cahill, Terry and Azpilicueta, whilst the midfield was set up to contest the physical threat of stoke, with Fabregas pushed forward to accommodate Mikel next to Matic. The rest of the attack was made up of Hazard, Willian and Diego Costa. The home side lined up with Begovic in goal, Bardsley, Shawcross, Muniesa and Pieters in defence, N’Zonzi, Cameron, Walters, Bojan and Arnautovic in midfield, and Crouch up front. 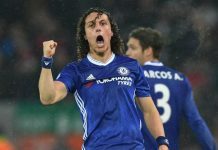 John Terry tried to alter Stoke’s game-plan in the second minute when he rose to head home from a Fabregas corner, but they resisted the urge to recklessly throw men forward, instead opting to try and disrupt Chelsea’s play whenever they crossed the half-way line. During the game the Potters did very little to dispel the perception of themselves as an overly-physical side, with Bardsley being the biggest offender. The defender was arguably lucky to stay on the pitch, first for a lunge on Hazard that he was only booked for, then for a cynical tug on Costa’s shirt, which some referee’s may have seen as a second yellow card. Impressively, Chelsea kept a good deal of possession in the first half with some tight control and accurate passing in and amongst the tough challenges. When the home side did put pressure on Chelsea’s goal they did so with a fair amount of threat – with the ball nearly creaping into Chelsea’s net after taking a wicked deflection, but Courtois managed to scramble it away. The Blue’s though were looking dangerous on the counter, which may have led to a second goal were it not for referee Neil Swarbrick getting in the way of Hazard’s pass during a three-on-one break. Another counter-attack could have put the away side 2-0 up on the half-hour mark, but Diego Costa dragged his effort wide when through on goal. Stoke were again on the right end of a contentious decision shortly after the interval, when Shawcross looked to clip Fabregas in the area. The linesman however had flagged Fabregas onside even though it was Walters who had played it backwards. The second half continued without much incident, and the fiery atmosphere had noticeably died down. For all of their neat passing, Chelsea only managed to create a couple of half-chances, whilst Charlie Adam flashed a long range shot just wide. Even though Stoke hadn’t given Chelsea many problems, 1-0 always seemed like it may not be enough, which is why Fabregas’ goal on 78 minutes brought much relief to Mourinho and his team. Eden Hazard picked the ball up just under 30 yards out and delayed his pass to Fabregas, giving the Spaniard just enough time and room to take a touch and force the ball home. Diego Costa should have wrapped the game up after a clever run from Schurrle, but his shot was saved well by Begovic. In the end it finished 2-0, with three points and a clean sheet in the bag, and a difficult away test was passed with steely efficiency.